Tony the Truck is new to the construction site. He meets and greets other machines: a digger, bulldozer, and forklift brothers Max and Rex. Fully illustrated book for kids aged 2 - 4 with two story tales. Both tales are short with simple texts tailored for young children. 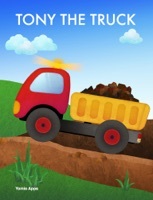 An iPhone/iPad game is also available for the book in the AppStore (search Tony the Truck).